Encore is our regular Patrons & Friends newsletter, which is delivered three times each year. 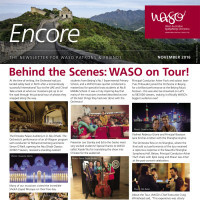 Patrons & Friends get a brilliant ‘behind the scenes’ insight into the Orchestra’s activities and are kept up to date with recent developments in the WASO world. You can read current and past issues of Encore by clicking on the year of issue below.